Climate is defined as a weather average. Both weather and climate refer to atmospheric conditions, but the timeframes are different. Weather describes short-term atmospheric conditions in a specific place – whether Monday next week will be hot and sunny in Timbuktu, Mali, or if it will rain in Dhaka, Bangladesh. 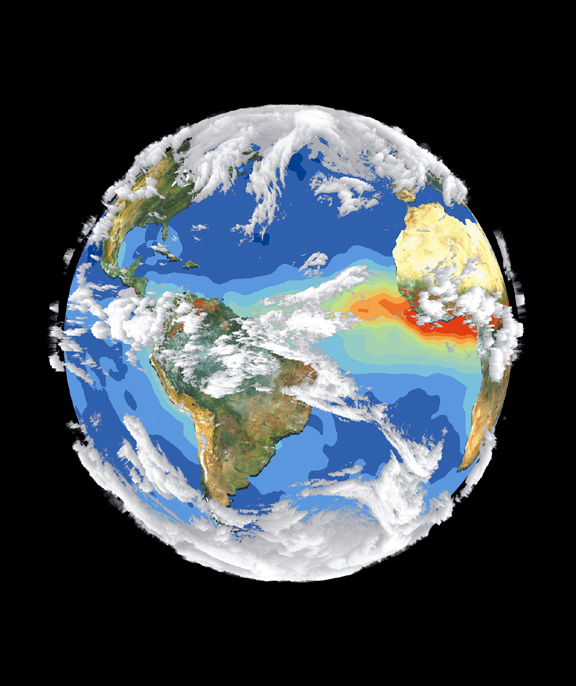 Climate is about atmospheric conditions over much longer periods - decades or centuries: the weather of Timbuktu and Dhaka can be the same on a given day, yet the climate of the two cities is very different: Timbuktu is in the Sahara desert and has a hot, dry climate, while Dhaka lies in the monsoon zone and has a hot, humid climate. According to the Intergovernmental Panel on Climate Change (IPCC), confusion between weather and climate is common: scientists are often asked how they can predict the climate 50 years into the future when they cannot predict the weather a few weeks from now. Predicting weather beyond a few days is difficult, as the development of atmospheric events – rainfall, etc - can be chaotic. The IPCC explains it like this: it is impossible to predict the age at which any particular man will die, but the average age of death for men in industrialised countries can be pinned down to 75. People often use the terms interchangeably, assuming that they imply the same thing. But there is a difference: global warming refers to an average increase in temperature near the earth's surface; climate change refers to changes in atmospheric events, such as temperature, precipitation, etc., measured over decades or longer. Climate change is the preferred term to use when you are referring to the influence of factors other than increase in temperature. The greenhouse effect is named after the conventional greenhouse, in which the glass walls reduce airflow and increase the temperature of the air trapped inside. The earth's climate is driven mainly by the sun. About 30 percent of the sun's light is scattered back into space, some of it is absorbed by the atmosphere, and the rest by the earth's surface. The earth's surface also reflects some of the sunlight, in the form of slow-moving energy called infrared radiation. The eventual escape of this infrared radiation is delayed by "greenhouse gases" like water vapour, carbon dioxide, ozone and methane, which bounce the infrared radiation back, warming the lower atmosphere and the earth's surface. Though greenhouse gases make up only about one percent of the atmosphere, they act like a blanket around the earth, or like the glass roof of a greenhouse, trapping the heat and keeping the planet some 30 degrees C warmer than it would be otherwise. However, human activities are making the blanket "thicker" because the natural levels of these gases are being supplemented by emissions of carbon dioxide from burning coal, oil and natural gas; by more methane and nitrous oxide produced by farming activities and changes in land use; and by several long-lived industrial gases that do not occur naturally. Climate change is not new, why blame human beings? Ice ages have come and gone in regular cycles for nearly three million years, and the IPCC says there is strong evidence that these are linked to the regular variations in the earth's orbit around the sun, called the Milankovitch cycles, after Milutin Milankovitch, the Serbian mathematician (1879-1958) who came up with the explanation. These orbital cycles mean that different amounts of solar radiation are received at each latitude during each season. There is still debate about exactly how this starts and ends ice ages, but many studies suggest that the amount of summer sunshine on northern continents is crucial: if it drops below a critical amount, snow from the past winter does not melt away in summer, more and more snow accumulates, and an ice sheet starts to grow. According to climate simulations, the IPCC says the next ice age could begin in 30,000 years. Each ice age, or glacial cycle, has been followed by a warmer interglacial cycle. In 2001, the US National Aeronautics and Space Administration (NASA), using a new computer climate model, reinforced the long-standing theory that low solar activity triggered the "Little Ice Age" from the 1400s to the 1700s. During the Little Ice Age, ice cut off access to Greenland from 1410 to the 1720s; canals in Holland routinely froze solid, glaciers in the Alps advanced, and sea-ice increased so much that there was no open water in any direction around Iceland in 1695. The NASA model recreated the impact of a dimmer sun, which brought large regional climate changes and the subsequent cooling of the continents during wintertime. According to NASA, between the mid-1600s and the early 1700s the earth's surface temperatures in the northern hemisphere appear to have been at or near their lowest in the last 1,000 years, and average European winter temperatures fell by 1 to 1.5 degrees Celsius. This cooling is evident in derived temperature readings from tree rings and ice cores, and in historical temperature records gathered by the University of Massachusetts-Amherst and the University of Virginia. Aerosols are small particles in the atmosphere with widely varying sizes, chemical composition and concentration. Volcanic emissions produce dust aerosols which block sunlight and can prompt short-term cooling. In 1815 the eruption of the Tambora Volcano in Indonesia lowered global temperatures by as much as 3 degrees Celsius, according to the US Geological Survey (USGS). "Even a year after the eruption, most of the northern hemisphere experienced sharply cooler temperatures during the summer months. In parts of Europe and in North America, 1816 was known as 'the year without a summer'." Volcanoes also emit CO2, and analysis of geological samples suggests that warm, ice-free periods coincide with high atmospheric CO2 levels. "On million-year time scales, CO2 levels change due to tectonic activity," the IPCC notes. However, according to the USGS Volcano Hazards Programme, while volcanoes release more than 130 million tonnes of CO2 into the atmosphere every year, human activities release more than 130 times that amount. Since the start of the industrial era in about 1750, the overall effect of human activities on climate has been a warming influence, the IPCC says. The average temperature of the earth's surface has risen by 0.74 degrees Celsius since the late 1800s. On a global average, warming in the 1900s occurred in two phases: from the 1910s to the 1940s (0.35°C), and more strongly from the 1970s to the present (0.55°C). An increasing rate of warming has taken place over the last 25 years, and 11 of the 12 warmest years on record have occurred in the past 12 years. The cause for soaring temperatures has been identified as the rise in atmospheric CO2. The concentration of CO2 in the atmosphere over the past 650,000 years has been accurately determined from Antarctic ice cores. During this time, CO2 concentration varied between a low of 180ppm (parts per million) during cold glacial times and a high of 300ppm during warm interglacial periods. Over the past century, CO2 rapidly increased well beyond this range and has reached 379ppm. According to the IPCC, the increase in atmospheric CO2 is known to be caused by human activities because the character of CO2 in the atmosphere, in particular the ratio of its heavy carbon atoms to light ones, has changed in a way that can be attributed to the addition of fossil fuel carbons. Scientists estimate that fossil fuel combustion, with a smaller contribution from cement manufacture, is responsible for more than 75 percent of human-based CO2 emissions. Science historian Spencer Weart says in his article, The Carbon Dioxide Greenhouse Effect, that the noted Victorian natural philosopher, John Tyndall, was among the first few scientists to state that layers of ice had once covered most of Europe, and that Swedish researcher Svante Arrhenius first described the greenhouse effect in the late 1800s. Arrhenius did calculations to show that cutting the amount of CO2 in the atmosphere could lower the temperature in Europe by 3 to 4 degrees Celsius – an Ice Age level. But his colleague, Arvid Högbom, had an incredible idea: he calculated the amount of CO2 emitted by human activity – industries, etc. - and found that it was responsible for roughly the same amount of CO2 as the natural geochemical processes. No one paid much attention. Around 1938 an English engineer, Guy Stewart Callendar, said that doubling the CO2 levels could lead to a 2 degree Celsius rise in temperature in the coming centuries. Again, no one paid much attention. Over the next few decades, several panels of scientists pursued various strands of research. Weart says it was only in the 1970s, when global temperatures were obviously up, that people began paying attention to warnings by scientists about greenhouse gas emissions. Governments got together in 1988 to set up the Intergovernmental Panel on Climate Change, comprising thousands of scientists, to draw conclusive evidence and advise them on the best course of action. Weart commented: "By 2001, this Intergovernmental Panel on Climate Change managed to establish a consensus, phrased so cautiously that scarcely any expert dissented."